Incredible as it may seem all these pictures are looking at almost exactly the same view at different times in history. Previously this position in the High Street had been part of the site of King Charles II's Palace, full details about this can be found on the page for the palace. In 1787 a small company of Congregationalists gathered together for worship in a room in the Grosvenor yard, though the exact location of this room is not known. On 25th May 1789 a corner stone was laid for a new meeting house that eventually became the Manse [a clergy house] in Fitzroy Street. This building was located on the corner of Fitzroy Street and Grafton Street (now Black Bear Lane). It was opposite what became the St Mary's Boys School, and located between what became the Swimming Baths & Kosy Kinema and the Real Tennis court in Fitzroy Street, behind Suffolk House. This new chapel was opened for preaching on 21st March 1790 by the Rev. John Townsend. Shown in the Newmarket Street Directories, in 1926 The Manse was occupied by the Rev. F. Brockis, and in 1936 by the Rev. Josiah Sidney Wilson. 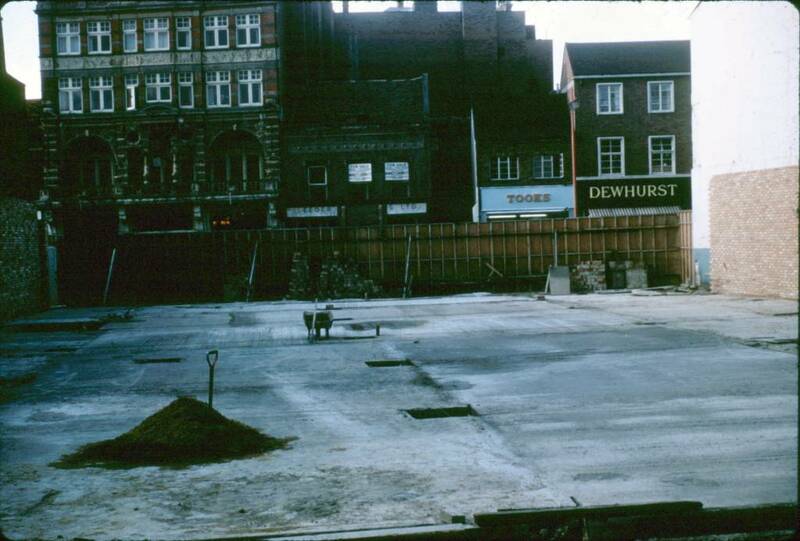 The Manse was eventually demolished in 1964 when Crisswell's Garage was extended and is now the location of Horse Requisites Newmarket Ltd. 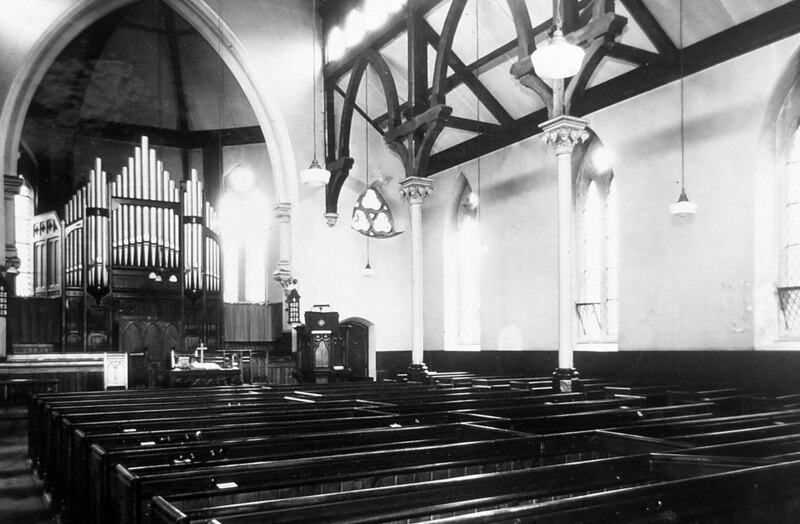 The church continued to grow and in 1854 there were 30 members. In 1860 the Rev. C. Bateman became pastor and he stayed until 1863. 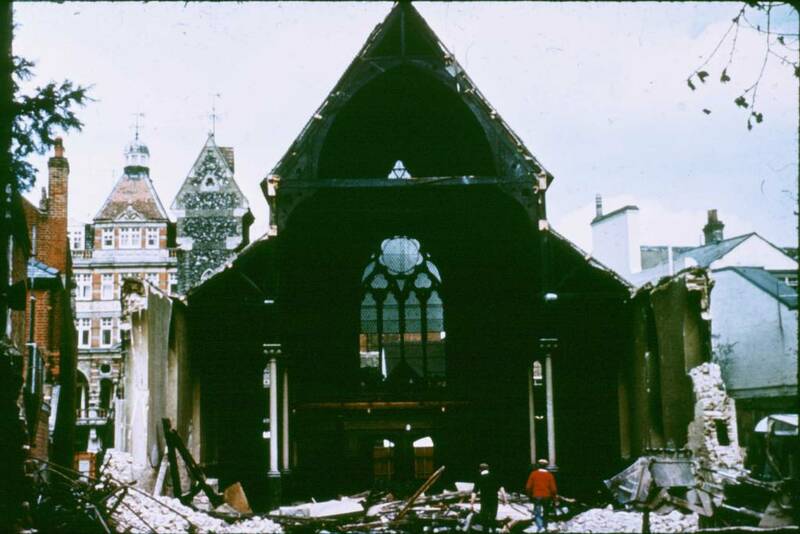 The church was at this time known as the Independent Chapel and it was around this time that one of its most important parishioners came on the scene. 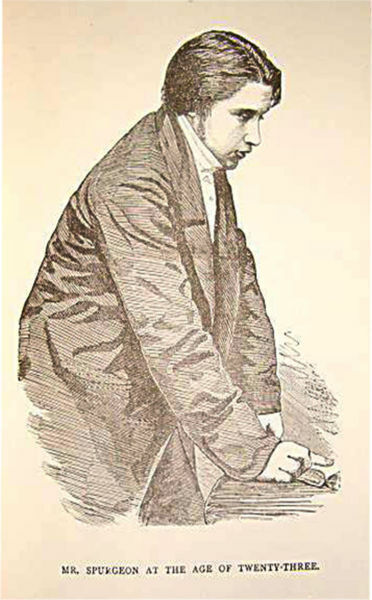 Charles Haddon Spurgeon was a very important and influential Baptist preacher, his life is documented in great detail elsewhere online, so this page will just concentrate on his time in Newmarket. Charles was born in Kelvedon, Essex on 19th June 1834. His father and grandfather were both Congregationalist ministers. In the morning of Sunday 13th January 1850, after wandering into a chapel in Colchester to escape a snowstorm, impressed by the expressive service that he witnessed he was converted to a Primitive Methodist. Shortly prior to this, on 17th August 1849, Charles had started working in Newmarket and later on 19th February 1850 he wrote a letter to his parents, describing how he was assisting at a school, and how the master there; Mr. Swindell, was a Baptist. Rev. John Swindell had his Mill Hill Academy near St Mary's Square and Charles was an articled pupil there, i.e. he had to work at the school in return for his tuition. Charles made four attempts to see the minister at the Independent Chapel without success, but after writing him a forceful letter he was eventually admitted as a member of the church on the evening of Thursday 4th April 1850. On 2nd May 1850 he walked the 7 miles from Newmarket to Isleham, where he stayed with the family of Mr. Cantlow, the Baptist minister in the village, and was publicly baptised in the River Lark on Friday 3rd May 1850. This location is now a place of pilgrimage for modern-day Baptists. Although he'd been baptised, this didn't automatically entitle him to receive communion at the Independent Chapel, but he continued to attend there during his time in Newmarket. During one of his teachings at the Sunday school in Newmarket Charles was heard by a clergyman from the Baptist church in St. Andrews's Street, Cambridge, who being impressed by his talk presented him with a British gold coin and invited him to join the Lay Preachers Association at the Baptist church in Cambridge. It was at this time that Charles met up with Edwin Sennitt Leeding, who he'd known previously when Leeding had been an usher at the school that Charles had attended in 1845 in Colchester. Leeding was now a teacher at a school in St. Andrew's Street and invited Charles to join him as an articled pupil to help run the school, which he accepted and left Newmarket in August 1850. Charles was at last able to take communion at the Baptist church in Cambridge and the story of his great preachings continues elsewhere ... he was still only 16 years old. Following this in 1851 John Swindell moved his school across to the other side of the town to Paradise Row, in an area that is now All Saints Road. It was a few years following this that the foundation stone of the new building on this site was laid on Saturday 11th October 1862, officiated by John Crossley, Mayor of Halifax, Yorkshire, and Chairman of the Congregational Building Society. A silver trowel was presented to Mr. Crossley by Miss Piper, a benefactor of the church who'd previously given a pair of communion cups and was later estimated to have given about £400 towards the building expenses. The estimated cost of the church at this time was about £3,000, which included £1,400 of promised money, a grant of £200 from the Chapel Building Society and the remainder eventually acquired following commencement of work. Stephen Piper, esq. was an influentual businessman who'd moved to Newmarket from Haverhill. In 1859, Stephen married Amelia Mary Ann Hilton, his second wife in Newmarket. Amelia (the Miss Piper detailed above) helped in the conversion of the old meeting house into the Manse, and gave generously towards the erection of the school. From Stephen Piper, Esq., Newmarket. Having been the means of introducing Mr. Swindell into Newmarket, I have felt considerable interest in his success. I have therefore made it my business to look into his Schoolroom, in order to see the method of his teaching, as well as to watch the progress of his pupils. The result has been, that I have felt great satisfaction with both. Several of his pupils, to my knowledge, who have left him at an early age, are now filling responsible situations, and are likely to become useful members of society; and I cannot doubt that, under the blessing of Providence, and the support of his friends, his labours will be rendered very useful to the rising generation. I am the more confirmed in this opinion from the happy manner in which he blends religious with secular instruction, by which means he gains the affection and esteem of his pupils, and consequently insures their progress. I have likewise attended his examinations, which are alike creditable to the master and pupils. I can therefore have no hesitation in recommending his Establishment to the notice of those parents who wish their sons to receive a good, sound, classical education, based on a religious foundation. In a book published in 1834 - 'Memoirs of the life and character of the late Rev. John Paul Porter', about a Baptist Pastor from Bath, we have the subcriber's names listed which included our Mr. S Piper, Newmarket and a Mr. Hassell, Newmarket. It's documented that the land that had been Queen Anne's Paviliion, part of Charles II's Palace, came into the possession of 'Messrs. Hull & Hassell', who were members of the Independent Church and who thought that with its wealth of Royal history that it would make an excellent site for a new Chapel. 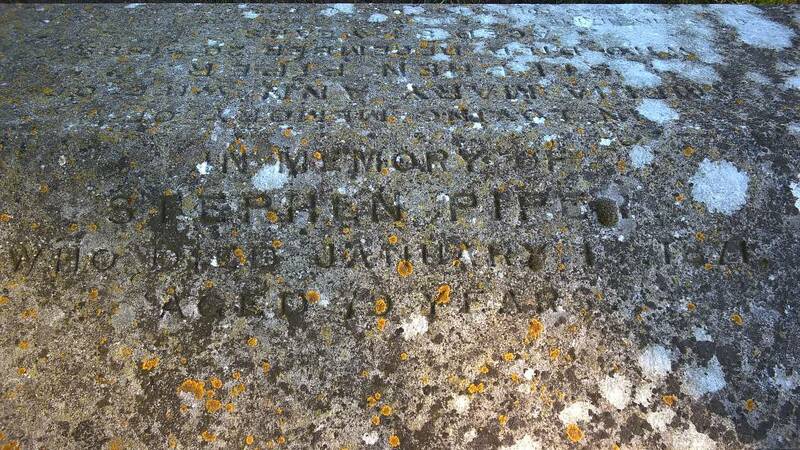 Joseph Hassell was a tailor in Newmarket at that time, he died in 1835 and Stephen Piper was one of the witnesses at the probate of his will dated 20th January 1836, which details Joseph's properties on the 'Front Street'. One probable contender for the Mr. Hull in the partnership is Henry Hull, cabinet maker of Newmarket, who clearly was a member of the Independent Church in Newmarket, as he had his son Fleetwood Hull baptised there on 7th April 1822 (along with all the rest of his family on the same day). 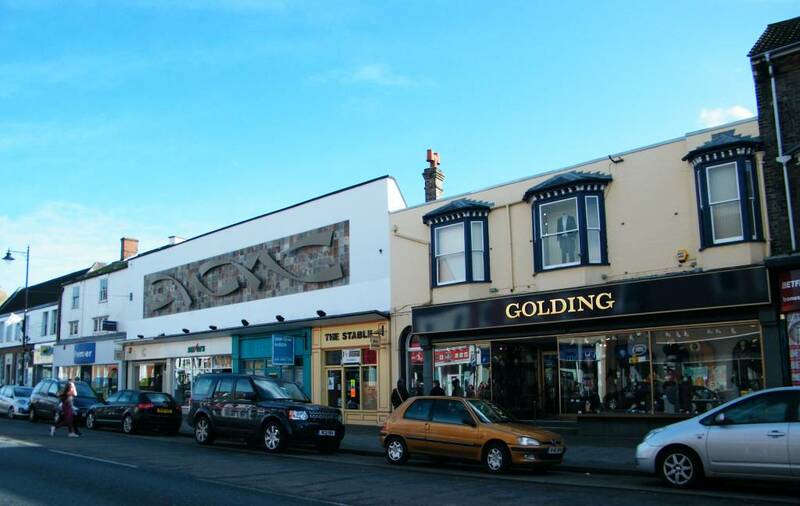 Fleetwood became an auctioneer and a cabinet maker like his father, and in 1861 had his shop a few doors along from here at No.35 High Street. Cleary Stephen, Amelia and 'Messrs. Hull & Hassell' were all instrumental in the events that eventually led to the construction of the Congregational Church at this location. 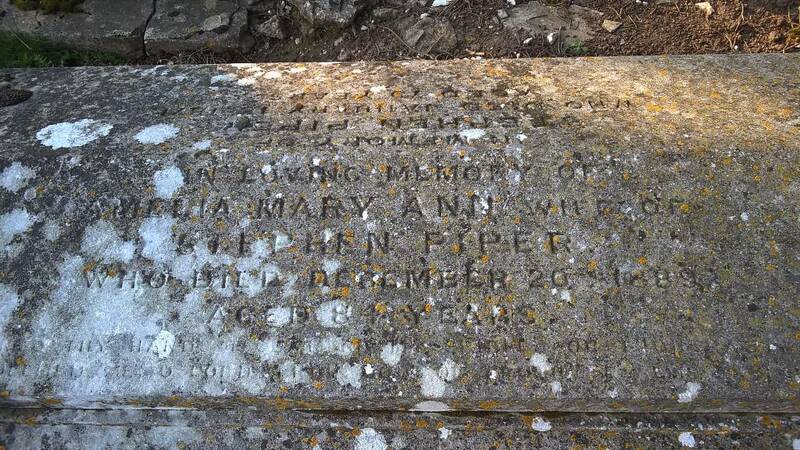 Stephen died on 13th January 1871, aged 75 and Amelia died on 20th December 1889, aged 84 - both are buried in Newmarket cemetery. 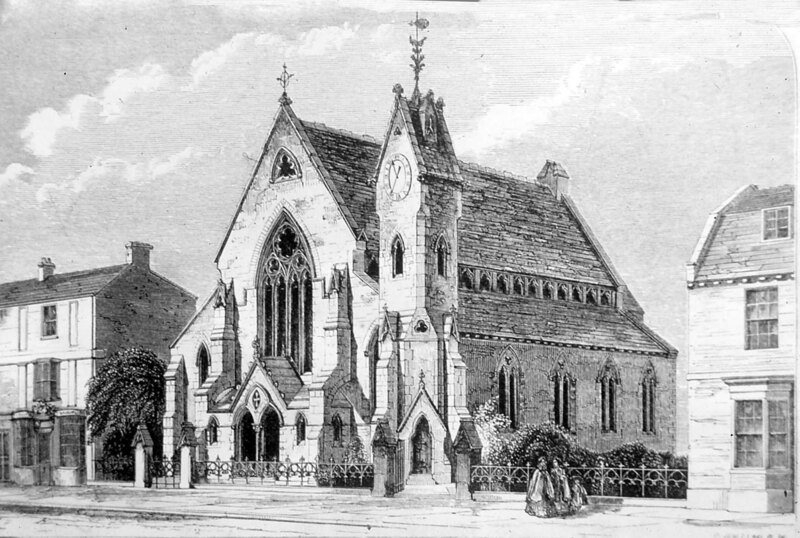 The opening service at the new church took place on Thursday 6th May 1864. Clearly the Congregationalists were gaining importance in Newmarket as an evening meeting held in the Chapel was attended by 750 people. At the time of its opening reference was made to its advantageous position in the High Street, contrasting with St Mary's which could scarcely be approached in wet weather owing to the puddles. Architects for the church were Messrs. William Gilbee Habershon and Alfred Robert Pite, of 38 Bloomsbury Square, London and the work was contracted to the builder Mr. Haines. The Chapel was in an early English style with internal dimensions of 68 ft. by 42 ft. At the south end of the building was a large octagonal apse [a semicircular recess covered with a hemispherical vault], with an artistically carved pulpit. The apse contained the organ and choir stalls and immediately in front of these was a slightly raised platform enclosed by oak rails used for the administration of the communion. Perhaps the most interesting feature of the building was the fact that most of the woodwork came from the old palace , which included the pews, communion table, chair and pulpit. Seating accommodation was for 700. At the north end was a gallery extending the whole width of the Chapel, supported by iron pillars, with a traceried iron front. The high pitched roof was of timber, below which was an arcaded clerestory [high windows above eye level]. The walls contained two light trefoil-headed windows, containing geometrical tracery, 25ft. by 12ft. Unfortunately these were damaged by the bombs which fell on Newmarket in February 1941. Attached to the chapel facing the High Street was a very reliable, well regulated clock ... apart from when it was stopped at 2.57pm on that day in 1941 - indicating exactly the time when the bombs fell. 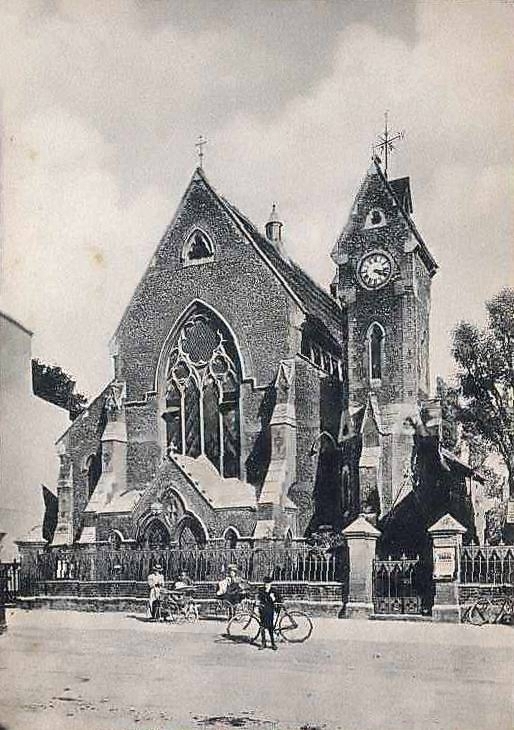 The railings in front of the church were sent to help the war effort in 1942. 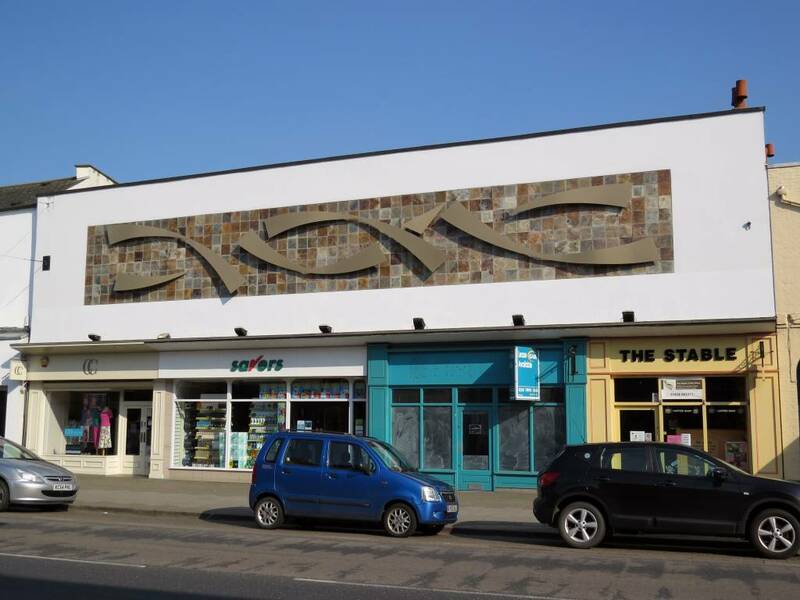 The exterior of the building, in spite of its battle scars, still retained its grand appearance. Miss Piper, already mentioned as a great friend and benefactor, offered to convert the old chapel into a manse if the church would build schoolrooms for a Sunday School. This offer was gladly accepted, and the schools were built and opened on Friday 14th September 1866, having cost £750. The graveyard was closed to burials in 1863 and laid out as a garden in 1900 [these dates seem to refer to the Manse]. The Sunday School prospered and in 1906 there were over 260 scholars on the books, and the average attendance was 200 in the morning and 220 in the afternoon. In 1886 requests were made for a new organ and the matter was put in the hands of Mr. Hambling - a name to be associated with the musical side of the church for very many years. On 19th February 1890 centenary celebrations were held, and in that year the new organ was completed. A lending library was established on 25th March 1875 and by 1906 there were 27 members and 661 books, the subscription being 6d per quarter. In 1906 the librarians were Messrs. Sherborn and Rogers, the secretary Mr. Hambling, and the treasurer Mr. Golding. 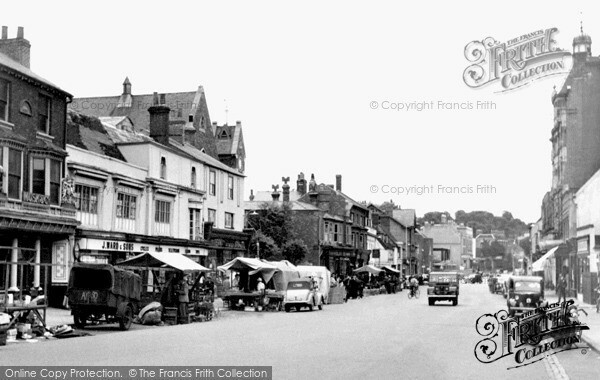 All very familiar Newmarket traders - Henry Robert Sherborn had his photography studio at No.35 High Street; Joseph Rogers was the solicitor nephew of Harriet Boyce of Boyce & Rogers on the other side of the road at No.114 High Street; Harry Hambling was a draper and had his shop next door to Boyce & Rogers at No.112 High Street; and Samuel Golding of course had his shop next door to here at No.67 High Street. There was a tablet on the organ blower dedicated to the Diamond Wedding Anniversary of Mr. and Mrs. Hambling, 1877-1937 who worshipped at the church for the whole of that period. Another Congregational parishioner was also extremely active in the local village churches and gave a piece of land at Dullingham Ley for the meeting house there together with three cottages, the idea being that the cottages would support the Missions at Dullingham and Stetchworth. Up until July 1920 Glenwood College School had been one of the major schools in Newmarket. 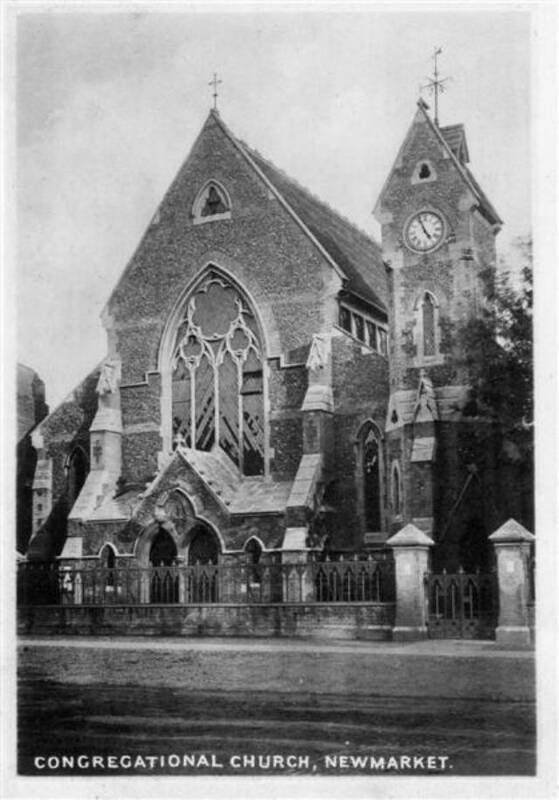 When the responsibility for schooling was taken over by the West Suffolk Education Committee that school was closed and on the 21st September 1920 a new Secondary School for boys and girls was opened in the school rooms behind the Congregational Church, when 57 boys and girls were enrolled. The new headmaster was the Rev. Charles James Napoleon Child, Rector of Moulton, and a former Master of Cambridge County School for boys. In addition to Rev. Child there was one full-time assistant teacher, Miss Mellis, and three part-time teachers. In November 1920, Mr. G.B. Osborne, B.Sc. (Maths and Geography) joined the staff and in September 1921 Miss Wakelin (French) was appointed in place of one of the part-time teachers. In January 1923, with a school roll of 75, the school moved to Foley House in St Mary’s Square and in September 1923 the Rev. Child resigned to be replaced by Mr. W.J. Watterson as headmaster, who remained at Foley House school until he retired in 1958. Just over a century after its construction was a sad day for the old Congregational Church, as in 1967, for the most obscure of reasons, this gorgeous gothic building was demolished. 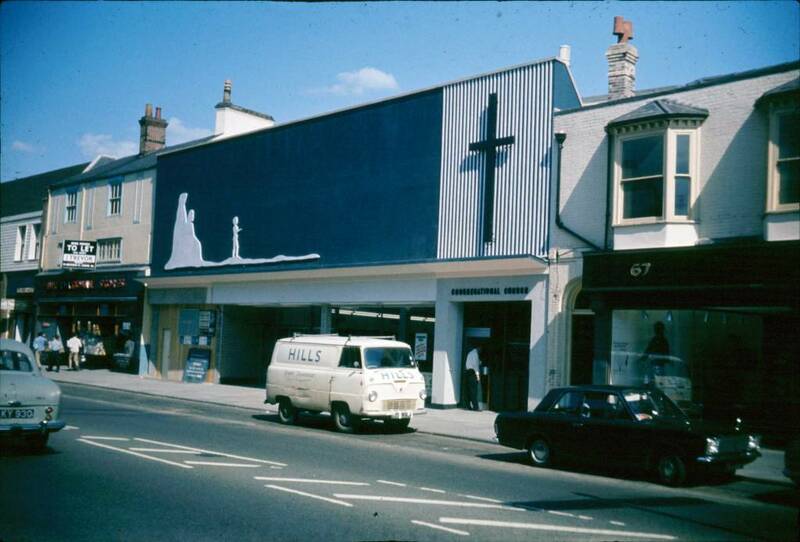 In its place a brand new steel & concrete modern Congregational Church was built, on this occasion situated on the first floor above what was to become the International Stores Supermarket. 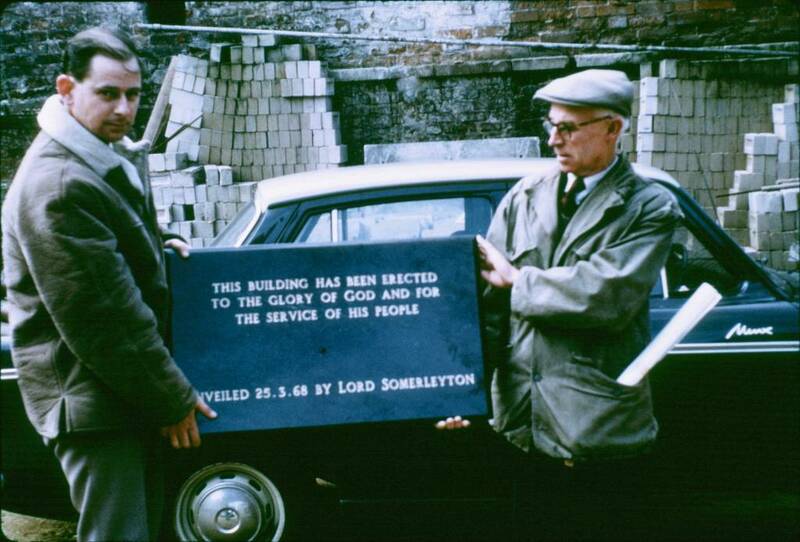 The church was unveiled by Lord Savile Crossley, 3rd Baron Somerleyton on 25th March 1968. Today the building still belongs to the Church but is now occupied by The Stable, a meeting place and cafe, open in the mornings. The Congregational Church amalgamated with Christchurch, a Methodist / United Reform Church Local Ecumenical Partnership which is in St Mary's Square, though on the second Thursday of each month there's still a Holy Communion service here at 10.30am in The Stable. 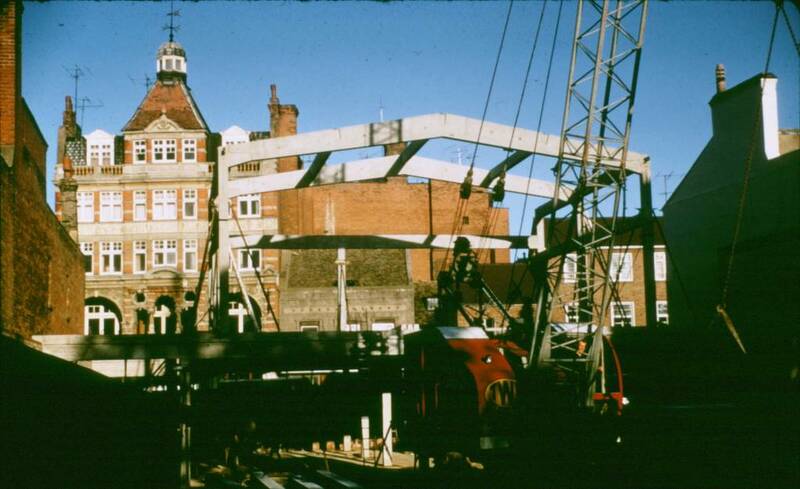 [Note from webmaster:- I was living in All Saints Road in 1968 and started attending the youth club in the newly built church. Coming from All Saints Road meant that I generally went up the steps at the rear and into the entrance on the first floor. I always remember the club playing Burt Bacharach's 'This guy's in love with you' and Arthur Brown's 'Fire', which came out in April and June respectively of that year. Many thanks to the Newmarket Local History Society for many of these details, which come from a document containing a detailed history of the Congregational Church compiled by George Ginn of Soham.